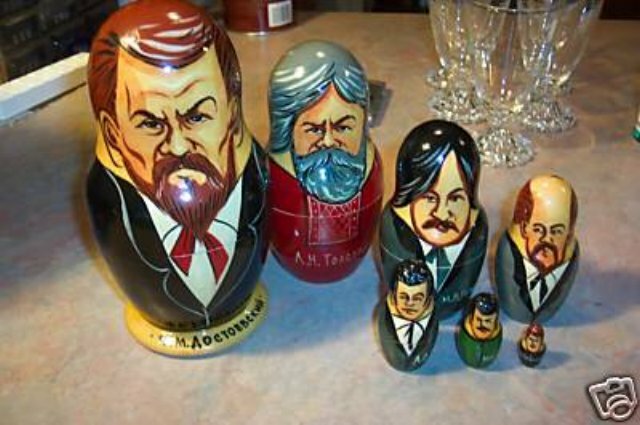 Russian Authors Matryoshka set is made in Russia and signed by the (St. Petersburg 2000) - each of the dolls has the name of the author on the front in Russian. The largest doll is 7.5” tall - very nice condition. Fyodor M Dostoevsky (1821 - 1881) Author "Crime and Punishment", etc. Aleksei N Tolstoy (1882 - 1945) Russian writer of sci-fi and historical novels. Nickolay V Gogol (1809 - 1852) Ukrainian - father of modern Russian literature. Nikolay A Nekrasov (1821 - 1878) Russian poet, writer, publisher. Alexander S Pushkin (1799 - 1837) Romantic writer, greatest Russian poet. Mikhail Y Lermontov (1814 - 1841) Romantic writer and poet. Sergei A Yesenin (1895 - 1925) lyrical poet – married dancer Isadora Duncan.